"Within the first Star Wars trilogy, Return of the Jedi is the third act of a three-act play. It was by its nature the episode in which many complicated, loose threads had to be tied together in a satisfying and triumphant resolution. 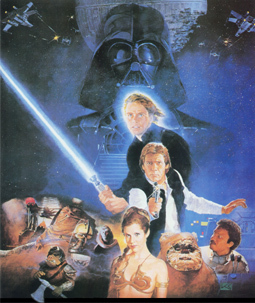 "Indeed, the story structure that I chose at the outset of the trilogy left so many plot points to be resolved in Return of the Jedi that writing the screenplay proved to be one of the greatest challenges. Han Solo had to be rescued. Leia had to choose between Luke and Han. Luke had to decide whether to join his father or fight him. Yoda and Ben had to reveal who was the Jedis' 'other' hope. "More than either of the prior two films, Jedi gave me the opportunity to explore philosophical issues of great interest to me. One theme central to the trilogy is that the potential for goodness and evil exists within each person, and is realized only by the choices that we each make. In Jedi, I was able to develop this theme in the dramatic confrontation between Luke Skywalker and Darth Vader before the Emperor. "Star Wars is also very much concerned with the tension between humanity and technology, an issue which, for me, dates back to even my first films. In Jedi, the theme remained the same, as the simplest of natural forces brought down the seemingly invincible weapons of the evil Empire." "When your father left, he didn't know your mother was pregnant. Your mother and I knew he would find out eventually, but we wanted to keep you both as safe as possible, for as long as possible. So I took you to live with my brother Owen on Tatooine... and your mother took Leia to live as the daughter of Senator Organa, on Alderaan." "I didn't want Vader to be all powerful. In the first film it would have been very easy to make him into some kind of evil superhero. But I decided not to do that. In fact, he is one of the Dark Lords who is working for the Emperor, and he has to do the Emperor's bidding. You will see at some point in the future that the Jedi have the same relationship to the Republic; they're like public servants, they're like marshals or policemen. They basically do what they're told to do. They're not independent agents who can do whatever they want. In the case of the Jedi, they work for the Republic, and in the case of the Sith Lords, they work for the Empire. So I obviously didn't want to make Vader too weak, but I didn't want to make him so you thought that he was in charge of everything. That's why I had Tarkin in the first film, although he was more of a bureaucrat."